BBC NEWS | Business | Where next for 'Steady Eddie' Stobart? Eddie Stobart could well be Cumbria's best known export. Every day, the country's best known road haulier sends its fleet of iconic green and red trucks out across the motorways and A-roads of Britain. With its smartly-dressed drivers and individually tagged vehicles sporting names such as Ana Louise or Rebecca Caron, Eddie Stobart is the first haulier to gain mainstream popularity outside the transport or truck-spotting community. Soon the famous livery will be seen on trains and planes. The company is launching a rail freight service this month, and has plans to start offering air freight distribution as well. On top of this, the firm runs a lucrative fan club with a range of toys and T-shirts. There is even an animated TV series featuring Steady Eddie. But just as with Steady Eddie's fictional adventures, the real-life transport firm has experienced its fair share of ups and downs. Eddie Stobart joined his father's agricultural contracting business in the 1960s and, over the next 30 years, built the firm into the UK's largest privately-owned haulage company. By the turn of the century, the Carlisle-based company had a fleet of about 800 trucks, a massive property portfolio and a turnover of some £150m. But although the company was at its peak in terms of size, it made its first loss in 2001 in the face of rising fuel prices, a shortage of trained drivers and tougher demands from its customers. Pretty soon, the Eddie Stobart fan club was making more money than the transport business. In November 2003, the company was taken over by railway infrastructure company WA Developments. 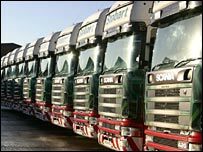 Eddie Stobart stepped down as chief executive of the company, to be replaced by another Stobart - his brother William, who had been operations director before joining WA. William's co-partner at WA, Andrew Tinkler, joined the haulier as chairman. "The company was struggling a bit and was downsizing operations," he says. "We had to go to some of our main customers and tell them, 'This isn't working for us, we need to raise our rates or stop doing these bits of work for you'." The tactic worked, and the company has been able to up its rates while keeping hold of existing contracts and winning new work with customers. These now include food and drinks companies Coca-Cola and Sara Lee, as well as supermarket giant Tesco. 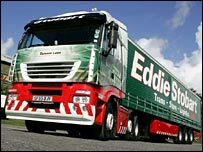 About 90% of Eddie Stobart's transport work is now under contract with three big transport depots - Daventry in Northamptonshire, Warrington in Cheshire and Carlisle. 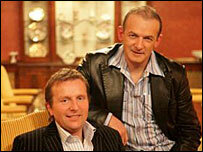 This side of the business is now back in profit, earning about £5m on a turnover of more than £120m. When divided among the company's fleet of 850 vehicles, it works out at a profit of about £6,000 a truck each year - an indication of how tight margins are in the transport industry. Warehousing is also a major part of the Stobart business. It now has more than four million square feet of storage space in distribution centres run for clients including Tesco, where it uses wireless scanners to speed up the processing of deliveries and provide real-time tracking. In conjunction with Tesco, the company is launching a new rail freight service on 19 September between the retailer's depots in Coatbridge, Lanarkshire and Daventry in the Midlands. With the help of nearly £500,000 in grants from the Department of Transport and the Scottish Executive, the train service should replace 260 lorry journeys a week. "We're in the business of moving our customers goods as quickly and efficiently as we can from A to B and we are constantly exploring new methods by which to do this," says Mr Stobart. "Rail freight is something we have been looking at for some time, along with air freight." It was the company's air freight ambitions that led to the choice of a new location for Eddie Stobart HQ. The company had been looking to move from its current Carlisle base and had been seriously considering a relocation further down the M6 motorway to Warrington - but these plans were shelved. "It would have meant taking 500 jobs outside of Cumbria and we were loath to do that," says Mr Tinkler. Could Carlisle Airport soon be the home of Stobart Air? Instead, the company wants to build a new headquarters and a 750,000 square foot distribution centre at Carlisle Airport, which was acquired by its parent WA last April. WA has plans to invest £20m in the site, turning it into a major regional airport with flights to southern England, Europe and beyond. 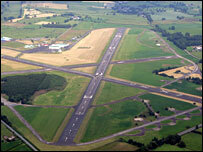 It is also looking at the feasibility of using the airfield as a base for a new air freight service. Trucks, trains and maybe planes. Eddie Stobart spotters will be spoilt for choice. Can west Cumbria reduce its reliance on Sellafield, the area's main employer?